ALEXANDER HAMILTON. Autograph Letter Signed “A. Hamilton,” to Elizabeth Schuyler, August 8, 1780. [Dobbs Ferry, New York]. 4 pp. 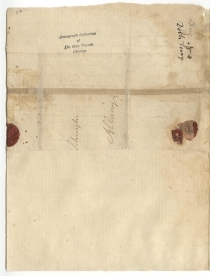 including partial integral leaf; lacking portion of page below signature; perhaps his signature on address relief was removed. 6½ x 8½ in. Immediately after dinner, I stole from a crowd of company to a solitary walk to be at leisure to think of you, and I have just returned to tell you by an express this moment going off that I have been doing so. You are certainly a little sorceress and have bewitched me, for you have made me disrelish every thing that used to please me, and have rendered me as restless and unsatisfied with all about me, as if I was the inhabitant of another world, and had nothing in common with this. I must in spite of myself become an inconstant to detach myself from you, for as it now stands I love you more than I ought—more than is consistent with my peace. A new mistress is supposed to be the best cure for an excessive attachment to an old— if I was convinced of the success of the scheme, I would be tempted to try it— for though it is the pride of my heart to love you it is the torment of it to love you so much, separated as we now are. But I am afraid, I should only go in quest of disquiet, that would make me return to you with redoubled tenderness. You gain by every comparison I make and the more I contrast you with others the more amiable you appear. But why do you not write to me oftener? It is again an age since I have heard from you. I write you at least three letters for your one, though I am immersed in public business and you have nothing to do but to think of me. When I come to Albany, I shall find means to take satisfaction for your neglect. You recollect the mode I threatened to punish you in for all your delinquen[c]ies. I would go on but the General summons me to ride. Adieu My Dear lovely amiable girl. Heaven preserve you and shower its choicest blessings upon you. Love me I conjure you. Eight years earlier, the then 17-year-old orphan had arrived in New York City with little money and few connections. 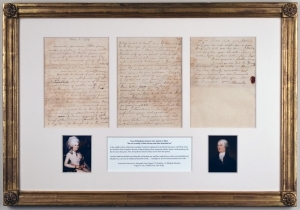 From his tumultuous early life in Nevis and St. Croix, Hamilton had written his way into a scholarship at King’s College (now Columbia University), public recognition as a political essayist, and a position as George Washington’s aide-de-camp. As both a student and a soldier, Hamilton had taken full advantage of his remarkable intellect to rise up. Elizabeth Schuyler was more than a match for Hamilton’s energy and ambition. The daughter of Revolutionary War General Philip Schuyler, Eliza had inherited a deep intelligence, an unconventional athleticism, and a sense of adventure. When Hamilton’s fellow aide-de-camp, Tench Tilghman, first met Eliza in 1779, he was struck by her sense of humor, strength, and easy warmth. Years later, Dr. James McHenry, another fellow aide-de-camp, noted that Eliza had “a strong character…glowing underneath, bursting through at times in some emphatic expression.” This natural energy, combined with Eliza’s piety and experience in managing her parents’ estate, made her exceptionally compatible with the equally passionate Hamilton. 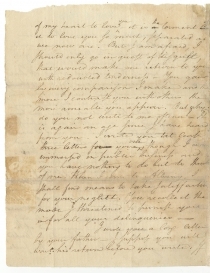 Our letter follows Hamilton’s more sober letter to Eliza of August 1, in which he urged her to consider that their social situation will be “a perfect lottery,” and to “examine well [her] heart” to determine whether she is likely to be happy in humble circumstances. 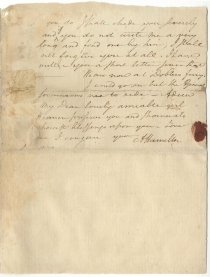 By the time Hamilton composed the letter offered here a week later, however, he seems to have been reassured of Eliza’s affections, and redoubled the flirtatiousness of his earlier letters. 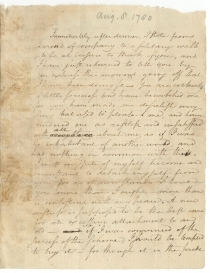 Several months later, Hamilton elaborated on his infatuation with Eliza in a coy letter to her sister, Angelica: “It is essential to the safety of the state and to the tranquility of the army- that one of two things take place, either that [Eliza] be immediately removed from our neighborhood, or that some other nymph qualified to maintain an equal sway come into it.… I solicit your aid.” Hamilton developed the subject again in an October letter to Eliza: “I love you too much.... You engross my thoughts too entirely to allow me to think of any thing else.” (Gilder Lehrman Collection, #GLC00773). Their intense courtship led to marriage on December 14, 1780. Eliza and Alexander’s correspondence and marriage no doubt marked high points in an otherwise unpredictable year. Though Hamilton relished military life, despite his frustration in being denied a command post, the Americans had faced high expectations and hard losses in 1780. In the South, the British had effectively occupied Georgia, and Charleston surrendered in May. In the North, American positions close to Morristown were put under siege in June, in an unsuccessful attempt to draw Washington’s army out of its stronghold. The arrival of the Comte de Rochambeau’s squadron at Newport in July inspired confidence that the balance of power would immediately shift in the Americans’ favor. Rochambeau, however, proved reluctant to proceed, and his troops were not committed to combat until mid-1781. Through July and August, as Hamilton wrote Eliza, Washington’s spy network intercepted critical British intelligence, which helped save both Rochambeau’s squadron and American troops on the Hudson. The Culper Ring was not able, however, to discover Benedict Arnold’s treason. When his defection was detected in September, after his hasty departure from a breakfast with Alexander Hamilton, Arnold had already turned over valuable strategic information to the British. News from the southern theatre also seemed grim. In mid-August, British advances against the struggling Continental troops resulted in 1,900 American casualties at the Battle of Camden, South Carolina. In the wake of this last tragedy, patriot spirits unexpectedly rallied. From September, North Carolina militiamen successfully fought off the British occupation of their state. In late October, Washington appointed the well-liked General Nathanael Greene as commander in the south, a move that revived the soldiers’ confidence and proved ingenious to American defense efforts.